Devil’s Dyke is a beautiful place to go for a walk. The amazing views give a great sense of openness and freedom when life in the city becomes a little too claustrophobic. This delightful view does not actually look out “over Devil’s Dyke”, which is in fact behind the Dyke Hotel out of view to the photographer’s left. This view looks west along the Downs and over the Weald. The nearer village is Fulking and that in the middle distance is Edburton. 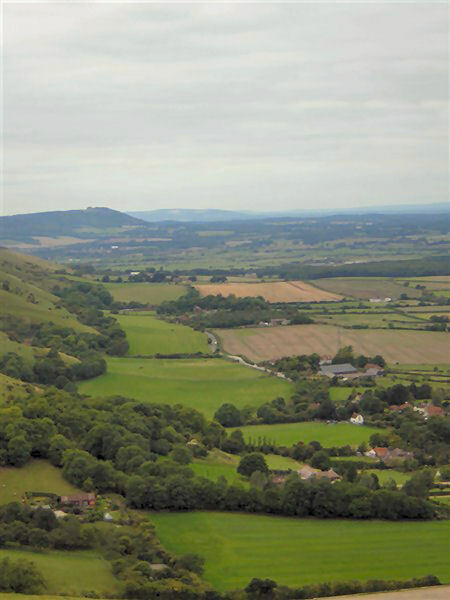 Below the further hills can be distantly seen Upper Beeding, Bramber and Steyning. A splendid historic picture of the Dyke itself can be found elsewhere on this site, as can much other valuable information about the Dyke and its history. Use that search facility! How about this for an escape from the busy city? A ten-mile circular walk starting and finishing at Hove Park and taking in the entire route of the old Dyke railway branch (more on which can be found elsewhere on this site). Starting at the south end of Hove Park, walk via Fonthill Road and Conway Street to Sackville Road, thence via Coleridge Street to Aldrington Station where the branch started. Go under the railway and thence via Amherst Crescent up to Old Shoreham Road: the line ran behind these houses. Take the footpath at the end of Holmes Avenue and emerge into Maple Gardens and thence Rowan Avenue. Again, the track ran behind the latter along what is now a footpath in Knoll Rec; with a short diversion you can walk this stretch. Find your way across Hangleton Road and around The Grenadier, and walk up the length of Poplar Avenue, behind which the rail route ran, and at the top of which you will be able to gain the trackbed itself along the Dyke Railway Trail. Follow this through wonderful open countryside with splendid views to Portslade and the sea until it diverges slightly at the old Golf Club Halt site, thence along the indicated bridleway to join the Devil’s Dyke Road. Cross this and take the bridleway which parallels it to the Dyke Hotel, whence the view above, and many others, can be enjoyed. Whilst walking the bridleway, look back to your left for the clear curve of the old railway alignment along the hillside back to Hove. Just before reaching the Hotel, look to your right for a great view of the Dyke itself from the same viewpoint as the historic view elsewhere on this site. Return via the same bridleway, but this time follow it all the way parallel to Devil’s Dyke Road until it ends near the traffic-riddled flyover across the ring road (take care here!). Walk down Dyke Road Avenue for a short distance and take the footpath on the right into Three Cornered Copse. Walk the length of the Copse until it emerges on Goldstone Crescent at the northern extremity of Hove Park, thence down through the park to your starting place. An exhilarating walk on a fine sunny day. What a beautiful place. I fell in love by the dog walk with my wife and her lovely family. It is so wonderful there just, a romantic magic place. All that light, all that green up and down. I will never forget this place. This photo was taken some years after the 1987 gales, as Chanctonbury Ring can just be seen as a shadow of its former self, in the distance. A splendid view that fills me with nostalgia. The house at the bottom left is, or was, called Hillside, and at the time the picture was taken was occupied by two friends of mine, Shirley and Ivan Thomas- they’ve moved now to somewhere a bit less remote, but were there for over 20 years, transforming what was basically a wooden chalet into a wonderful house with a fantastic garden. Sitting in the sunroom looking across the Weald was a privilege indeed, and so many wonderful walks nearby- the variety of wild flowers in the downland turf was extraordinary. I recall many years ago getting the train to Brighton from Newcastle (where I made my home) and walking up to the Dyke past Hangleton where I used to go to school, passing the remains of the Dyke railway station (the track left the main line at Aldrington), and having my breath taken away by the vista that opened up when I got to the Dyke Hotel. It’s truly one of the best views in Britain.